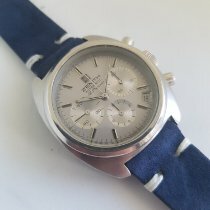 1970's Vintage Zenith Iconic Collectible El Primero Ref. 01-0210-415 Stainless Steel watch with Original Silver Dial with Applied Steel Stick/Bar/Baton Markers. Triple Signed.